A surplus of food, and a dearth of required physical labor, causes a boom in obesity and Type 2 diabetes. A surplus of wealth and a dearth of cost to accumulate physical belongings, and we have a nation of larger and larger houses, stuffed full of junk, plus a booming industry in self-storage facilities. A surplus of information, and means for obtaining it freely or so cheaply as to be nearly free, and we end up perpetually engaged with our internet connections (via computer at work and home and phone everywhere else). Plentiful and inexpensive antibiotics, and we end up with a depleted microbiome, with our immune system misfiring us into allergies and auto-immune disorders. We seem to have a lot of systems which are breaking in unaccustomed ways, lately. I think I see the common thread. Imagine for a moment, if we suddenly had a declining force of gravity. How well would our architecture hold up? Everything about the way we build large structures is based on resisting the force of gravity, which tries to pull it down. So as well is the method we use for filling those buildings (our furniture isn't generally bolted to the floor, for instance). Our water reservoirs are generally lakes, not tanks. How well would this all work if gravity went away? When you've only ever needed to worry about an environment in which things are pulled down, then a zero-gravity environment can reveal a lot of fundamental problems. Our appetites are based on the idea that greens are relatively easy to find, meat is harder, and sweets are harder still. We have sweet tooths, and perhaps as well a taste for savory, but most humans don't have a specific craving for greens. Our craving for greens, is called "hunger", because in the past that's all that was required to make sure we ate our vegetables. Most of the time when we got hungry, there was no meat and no sweets around, so we would eat vegetables often enough regardless. "Eat sweets if you find them, whether hungry or not; eat savory when hungry if you can; eat non-savory when hungry if that's all you've got." It was a perfectly functional set of drives for a hunter-gatherer on the African savannah, or even for a medieval peasant. Why would you need to have a craving for vegetables specifically? Until we discovered sugar, and produced meat in quantities sufficient to gorge ourselves with burgers every meal if we felt like it. Systems that evolve in a state of perpetual shortage, need no off switch. Similarly, we have far greater capacity for laziness than is healthy now. This made perfect sense when we were likely to have more physical labor in front of us every day than we could afford to take on. If food is in short supply, and labor is ever-present, then laziness is a good instinct. Children DO have a drive that says "get up and run around", and it can drive the adults around them crazy, but that is because they need to use their muscles in order for their agility and strength to develop. Once we reach physical maturity, that drive goes away, because until recently there was no need for it. We are lazy, and take the easiest way whenever we can; pushing ourselves to physical exertion takes an effort of will (e.g. taking up running or biking). We feel better if we do it, but no drive on the level of laziness (ironically a very strong and ever-active instinct) urges us to get up and move around. Our laziness drive has no off switch, because until recently we never needed one. The same process, as others have noted, has occurred with material possessions. I don't mean things like your primary car, or the shoes you wear almost every day. I mean the things that are in your house, that on a typical day you don't use, and also don't like seeing. If you like having it on the wall, it's not useless. If it's sitting in piles that make you dislike the appearance of your home, or especially if they sit in boxes that rarely if ever get opened and never used, then it is the equivalent of eating that dessert that wasn't especially good, nor nutritious, but which you ate because you didn't have enough willpower (at that moment) not to. We spend a lot on our space for living. Whether buying or renting, you are spending money every month for space in which to make your home. If you pay $1000/month to rent a 1000 square foot home, you're paying $1/month for each square foot of space. If something that takes up a square foot is brought into your house, you just took that square foot of space which you paid money for, and chucked it out the window. Notwithstanding that, you'll have to keep paying for it. So, if the stuff that is taking up that space is not worth paying $1/month to keep, you ought to get rid of it. We have a hard time thinking this way, though, because we evolved for an environment in which space was relatively cheap, but stuff was expensive. Material goods used to be rare, and so our urge to acquire them didn't need an off switch. I'm not sure if it's even necessary at this point to outline how we have the same problem with information. Non-stop news, non-stop tv series we can "binge watch" on DVD or Netflix if we missed it the first time, social networks with a never-ending stream of updates (mostly in the form of pictures of other people's meals, it sometimes seems), there are a lot of streams of information hitting our eyeballs, if we let them. They all, to one extent or another, appealing to our urge to acquire information about other people. That is, our urge to gossip. The term "gossip" sounds judgemental, but in its origin it is a healthy instinct. The hunter-gatherer in a group of 100 or so other individuals would do well to spend a fair amount of time monitoring what others in their group are doing or thinking. Humans are tricky, even for other humans, so the urge to gossip is just a way of studying your most important subject matter. A certain amount of fictional gossip is probably also healthy; we use fiction to explore situations in how humans relate to one another that are too dangerous or too rare to learn about first-hand. But when applied to celebrities, fictional characters, people across the world who we will never meet, or to more people than around 100 (see Dunbar's number), it becomes less and less useful, and more and more of a distraction from getting anything done in life. If you spend an hour a day on social networks, two hours a day watching TV, and another hour sending and answering texts, you have used up most of your waking, non-working life (unless you exclusively do these things while at work, of course, in which case you have a different problem, one which will probably solve itself). If you have such a drive to communicate with others that you can't put the phone away to sleep or drive a car, you have gone far past the point of usefulness. Until recently, however, we didn't know that many people, or have that many works of fiction available to us. Our gossip drive has no off switch, because until recently we never needed one. 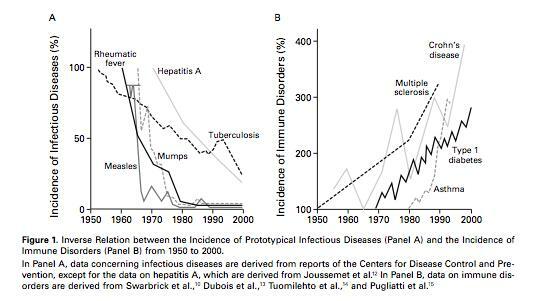 What it shows is that at the same time a wide variety of infectious diseases were eliminated, we began to see the emergence of widespread problems with an equally wide variety of allergies and auto-immune disorders. More persuasively, similar graphs can be produced for other countries, with different timelines but similar correlation between the two groups. Even more persuasively, re-infecting patients with relatively harmless infections like whipworms, can result in marked improvement in conditions relative to those who don't receive the treatment (click on the image to see discussion of one such study, and links to several others). So at one time we thought of infections as "bad" or "harmless". Then, we began to realize that some systems (not only immune system, but also digestive) rely on certain microbes, and upgraded that to "bad", "harmless", or "good". But it appears to be even more complicated than that. The available evidence suggests that some of the microbes which can help with severe allergies or autoimmune disorders, are themselves not entirely benign. It's even more complex than suggesting that some microbes have a mix of good and bad affects; the bad affects and the good affects may be the same thing. Our immune system appears to be like the kind of busybody who is always running around looking for a problem to fix. If you need help, they can be great friends to have; if everything's fine, they can be drama queens of the worst sort. At times, it almost appears that they stir up trouble in order to have something to do. One also thinks of the security establishment in this and many other countries: they may be useful against a real opponent, but if no real threats are around, they will manufacture one. Our immune system, then, does not have a very good off switch. Through most of recent history (at least since we started living in an agricultural lifestyle, and based on studies of hunter gatherer groups perhaps even before), this was not a problem. Sometimes there were serious infections to fight off, sometimes relatively benign ones such as whipworms. Never was there such a dearth of infectious agents that cedar pollen, dust mites, mold, or one's own self would become the target of the immune system. Until now. Across multiple fields, then, we see the effects of the End of Gravity. What is less clear, is which is a better solution: restoration of shortage (of food, of labor-saving devices, or information streams, of antibiotics), or trying to invent for each of these systems an effective Off Switch (like interior decorators who start to bolt everything to the floor when the gravity goes away). Which is harder: Restarting Gravity, or Learning to Live in Zero Gravity?